Stephanie Lynn “Stevie” Nicks (born May 26, 1948) is an American singer-songwriter, best known for her work with Fleetwood Mac and an extensive solo career, which collectively have produced over forty Top 50 hits and sold over 140 million albums. Rock a Little was the third studio album by Stevie Nicks and was released in late 1985 while Fleetwood Mac were still on a lengthy hiatus following their album Mirage in 1982, Rock a Little hit the top 20 in its second week and ultimately peaked at #12 on the U.S. Billboard charts, and was certified platinum after just 1 month of its release.Although sales did not match Nicks’ earlier albums, Bella Donna and The Wild Heart (both selling in excess of 4 and 2 million copies in the U.S. respectively), Rock a Little produced the hits “Talk to Me” (US#4), “I Can’t Wait” (US#16), and the mainstay encore for Nicks’ live shows, “Has Anyone Ever Written Anything for You” (US#60). 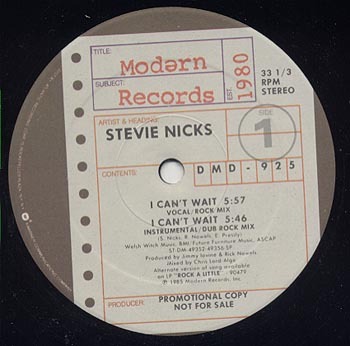 The US Promo 12″ release of “I Can’t Wait” contained four great rock remixes, Chris Lord-Alge contributed the Vocal/Rock Mix and the Instrumental/Dub Rock Mix while Steve Thompson and Michael Barbiero worked their magic on the Vocal/Dance Mix and Instrumental/Dub Dance Mix.